12 players at a time. 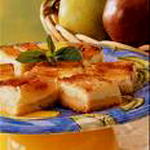 When planning my Bunco menu, I rely on fast and easy appetizer and dessert recipes, like these Pear Custard Dessert Bars. Every time I serve them, somebody asks me for the recipe. Really no matter what kind of theme party I am hosting, I ALWAYS look for recipes with these characteristics. Do you have any such recipes that would work well for a Bunco Theme Party that you are willing to share? 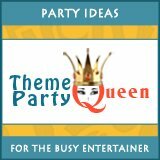 Also, if you are hosting a Bunco Theme Party and are looking for some ideas yourself, don't forget to check out our Bunco Theme Party webpage. You will find details on how to play the game, a free Bunco scorecard, ideas for invitations and decorations and recipes for some of my favorite Bunco Theme Food, including the Pear Custard Bars above. What's Your Favorite Bunco Theme Food?